Congress recently extended copyright duration to 99 years if owned by a corporation, or the life of the author plus 50 years if the author retained the rights. Widely referred to as the Sonny Bono law, it was assumed to be a favor from Congressman Bono to the Walt Disney Corporation, whose copyright on Mickey Mouse was nearing expiration. Eldred, a publisher of reprints of old books, took this matter through the courts as an action against John Ashcroft, the Attorney General, to prevent his enforcement of a law which, in their view, violated the intent of the Constitution. Thus, the case of Eldred v. Ashcroft came up for oral argument at the U.S. Supreme Court. Since I was interested in reprinting important books about the dim Philadelphia past, and discovered it was now usually impossible to determine who had copyright ownership, I went to Washington to hear arguments which might clarify the best approach to take. And perhaps to take the measure of the people on both sides of the argument. fubar So, the Metroliner to Washington and overnight in a hotel. On advice of people who knew people involved in Supreme Court matters, I set my alarm for 5 AM, arrived at the Court building at 5:30 AM. It was still pitch dark at that hour, and rather cold. Occasional fine showers would describe the weather. When I arrived, there were already 75 people standing in line. Several policemen kept the line in order, and chatted affably with the standees by way of implying that it wasn't their fault. When it's dark and the line is rather impromptu, some people will try to cheat on the queue, especially since many standees didn't know whether it made a difference or what to do if it did. What to do is to shout at the culprits to get back to the end of the line where they belong, which they mostly do after the policeman shambles over. At 9:30 AM, the line started to move forward. The policemen had been counting, too, and came back to about where I was standing. Sorry, sir, this is all that will be allowed in. What to do? Well, you can stand in another line to be formed, for fifteen-minute tourist visits, first-come, first-served. As events unfolded, however, a number of people at the very front of the line had been paid to hold a place for someone else and the someone else didn't show up in time to get in as the line surged forward, so there were a few extra seats and I got one. I didn't dare get out of line to count the people behind me, but it was surely several hundred, forced to end up in the fifteen minute line. The crowd exchanged a lot of grumbles about all this, mostly with focus on why don't they allow this to be televised. Why not, indeed. Inhibiting the behavior of the Justices might be one explanation. Some of them sat there silent as a stone, but many of them interrupted at will, and with acidity. Not only are the counsels at a great disadvantage in trying to make nice to people who will decide their case, they are strictly limited to concise presentation, where a interruption breaks the stream of argument. It becomes very clear that the proceedings are not held primarily for marshaling all arguments -- weak and strong -- on both sides, but rather to summarize the strongest, and give the Justices a chance to ask questions. The Justices and their clerks have presumably already read the full arguments which have been printed and handed in. This really isn't a trial. 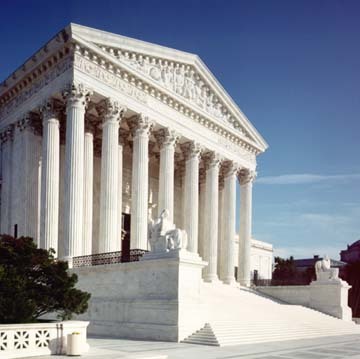 Public comments ("amicus briefs") must be printed and attached to the main briefs at the time the Court agrees to hear the case ("grants a writ of Certiorari")). Since the Court only agrees to hear a hundred cases a year, it "grants cert" less than 2% of the time. A case is supposed to be ripe for decision, all useful arguments having already been voiced, when cert is granted. So, under the present understanding of things, it may not be time to put these oral arguments national television. A more important step might be to find an effective way to publish the briefs on the Internet. Even then, the Court will probably squirm at the idea that they must listen to huge media campaigns, orchestrated to convey the implication that the Justices better yield to public opinion wrapped in the spin of the litigants. Since Walt Disney owns one of the three national television networks, that might not be an impossible development. To get back to this case, it seems a little strange that copyright protection was deemed important enough to be among the few basic principles in the Constitution. Many have expressed the opinion that patents and copyrights must have originated with Ben Franklin, the only real author and inventor attending the secret Philadelphia meetings of the Constitutional Convention. For what it is worth, the minutes show it was Madison who proposed the idea, Pinckney who seconded it, but Franklin was the world's expert on keeping his fingerprints off ideas. Most of the members of the Convention, farmers though they were, were also members of the first Congress under the Constitution, when that Congress set the time of copyright at seventeen years. It is a pity they did not say so in 1787. In the eventual 7-2 Eldred v. Ashcroft decision, Justice Ginsburg chose to define the issue at stake as whether Congress had the right to set the duration of patents and copyrights. Of course that was always beyond real dispute. But whether anybody ought to set it at 99 years, well beyond any author's lifetime, emphasizing the point by adding 50 years to any author's lifetime, introduces fundamental questions of wisdom. One by one, every single Justice found a way to observe that this law was not wise. But rather than stir up a controversy with Congress over the fundamental rights of each branch, the Supreme Court seems to have decided to give public opinion a chance to force Congress to eat its words. Although the decision in Eldred is a disappointment to me and my private interests, I can live with it as a concession to public tranquility. But I really don't see why an overflow auditorium could not be provided next to the Court, where people who travel on the Metroliner and stand in the dark and cold for five hours, could at least watch a closed-circuit version of the oral arguments.